The notable increase Sri Lanka saw in export earnings was offset by racing imports in December 2017 to record the highest trade deficit for the first time in 5 years, the external sector data released by the Central Bank showed. Sri Lanka’s export earnings in December 2017 surpassed a billion dollar mark for the fifth month in 2017. But the country imported goods worth over US $ 2 billion in December, recording the highest monthly import figure in the history of the country. As a result, the trade deficit exceeded the billion dollar mark in December for the first time in more than 5 years. The last time Sri Lanka recorded a trade deficit of over a billion rupees was in 2012 November. Although the growth in export was a sound 19 percent for the month from a year ago, the country’s thirst for fuel, iron and steel, staples such as rice and other food and beverages, vehicles and gold pushed the import bill by almost 13 percent during the festive month from a year ago. The December fuel bill surged 32 percent year-on-year (YoY) to US $ 433.3 million and by 38 percent YoY to US $ 3.4 billion for 2017 with close to half of it spent on refined petroleum imports amid the rising global oil futures throughout last year. Global oil price flirts little under US $ 70 a barrel in the Brent futures exchange and if the price holds above that level it could cause definite worries for the island nation dependant on imported oil as the country runs an extremely fragile external sectors with a serious external debt hangover from 2019 onwards, analysts have cautioned. 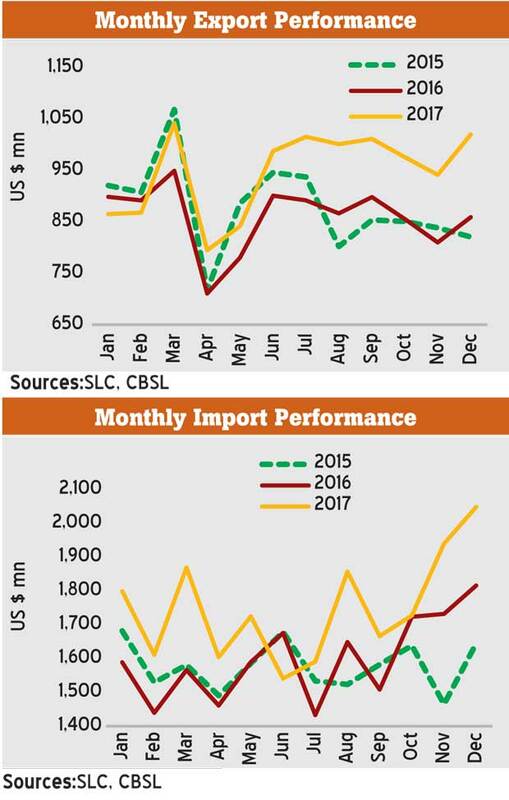 December trade performance provided a proxy for the full year performance as Sri Lanka recorded a US $ 10 billion hole in its trade in goods account. This was despite the US $ 11.4 billion in export earnings – the highest ever recorded in a single year – up 10.2 percent from 2016. Import expenditure closely followed with a 9.4 percent growth YoY to record US $ 21 billion. Little less than 50 percent of Sri Lanka’s imports come from India (21.4 percent), China (18.8 percent) and Singapore (6.2 percent). Sri Lanka has a free trade agreement with India and signed a fresh pact with Singapore in January this year. The authorities are working on a similar trade pact with China. Meanwhile, among the notable performances in the export basket were the textile and garment exports, which surpassed the US $ 5.0 billion milestone in earnings recording an increase of 3 percent YoY. During December such exports rose by a healthy 19.4 percent YoY to US $ 470 million. The restoration the GSP Plus facility to the European Union (EU) in May 2017, helped the local exporters to achieve such a feat, the Central Bank said. “Earnings from garment exports to the EU increased by 27.2 percent YoY while garment exports to the USA and other non-traditional markets increased by 18.0 percent and 14.1 percent, respectively, during December 2017”, the Central Bank said. Meanwhile, the higher average tea prices and the volumes during 2017 pushed the tea export earnings by 15.6 percent YoY in December to US $ 127 million and 21 percent YoY to US $ 1.5 billion for the full year, boosting the total earnings from the agricultural imports for the year. Sri Lanka recorded a surplus of US $ 2.07 billion in the Balance of Payment (BoP) in 2017 as the country received earnings from tourism, investments in to the stocks and bonds, direct investments and loans in dollars albeit some slow down in remittances. This is in comparison to a deficit in the BoP of US $ 500 million in 2016, the data showed. Although the worker remittances – the single largest foreign income earner for the country – slipped 1.1 percent in 2017 from a year ago still fetched US $ 7.2 billion to the country. Earnings from tourism were also up by 3.2 percent for the year to US $ 3.6 billion. Both remittance income and tourism earnings coupled with any other earnings from services exports such as information technology and business process management activities cover up the hole left in the trade in goods account which neared US $ 10 billion in 2017. Meanwhile, the financial account of the BoP is amply buttressed by the portfolio flows into the Sri Lankan stocks and bonds and the loans taken by the government of Sri Lanka through sovereign bonds and other lenders. The net inflows to the Colombo Stock Exchange during the 12 months were recorded at US $ 279 million against just US $ 19 million during 2016. Meanwhile, the foreigners invested US $ 1.67 billion in government bills and bonds during 2017, up from US $ 1.24 billion in 2016. Besides, the Central Bank raised US $ 1.5 billion in sovereign bonds in 2017. Further US $ 1.54 billion worth of long-term loans and a billion dollar worth of foreign currency term facility was taken by the government during the year. “Proceeds of Hambantota port in the form of FDI as well as receipt of the fourth tranche under the EFF from the IMF were instrumental in strengthening the financial account of the BOP in December 2017”, the Central Bank said. The foreign direct investments during the first 9 – months reached US $ 766 million against US $ 397 million for the same period in 2016. As a result of these inflows plus the direct purchases of dollars from the market to the tune of US $ 1.6 billion, the gross official reserves of the country reached US $ 8.0 billion— equivalent to 4.6 months of imports—by end 2017 compared to US $ 6.0 billion recorded by end of 2016.